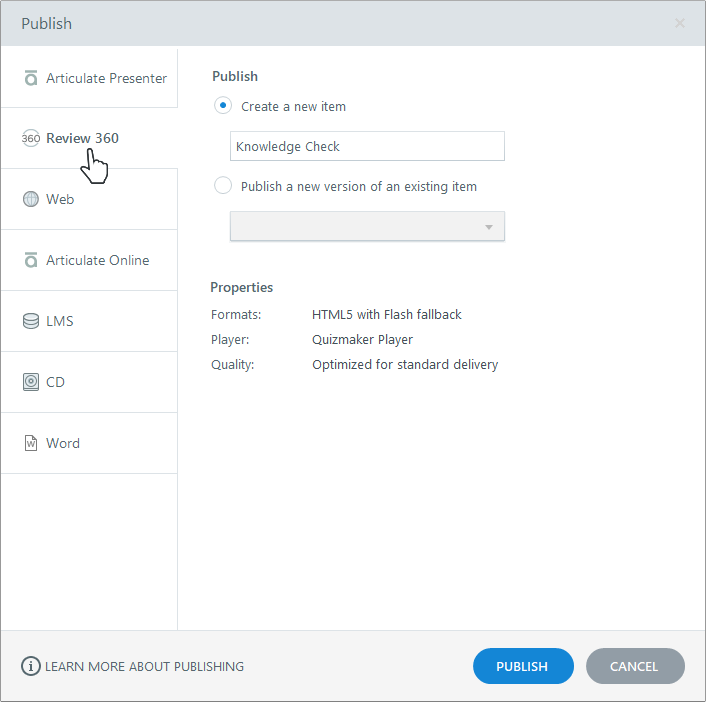 Publish your quiz to Review 360 to collect feedback from stakeholders and track version history. It’s a great way to collaborate on a project before distributing the finalized quiz to learners. By default, Quizmaker uses an image of the first slide in your quiz as the thumbnail image on your Review 360 home page, but you can choose a different image. Click the hyperlinked text below the default image, then select a different slide in your quiz or click Picture from File to choose an image on your hard drive. 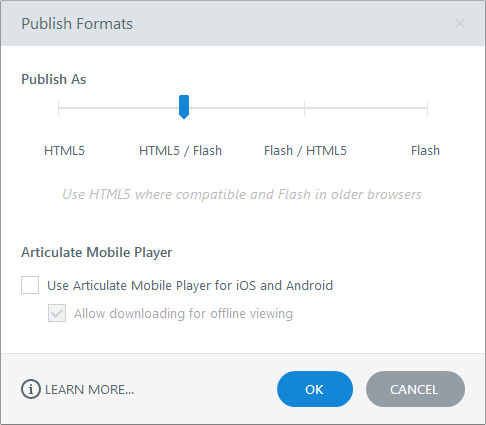 After downloading a quiz to their Articulate Mobile Player, learners can view it at any time, with or without internet access, even if you remove the quiz from Review 360. The Player property shows the name of the player currently assigned to your project. (The player is the interface viewers see around the perimeter of your quiz.) To make adjustments to your player, click the player name to open the player editor. Your content gets published and uploaded to Review 360 all at once. How fast this happens depends on the size of your quiz and your internet connection. When the Publish Successful window appears, click View Quiz to open Review 360 in your default web browser and manage the quiz you just uploaded. Open your web browser to your Review 360 home page and click your quiz to open it. If you don’t want viewers to post comments on your quiz, click the ellipsis (...) button in the upper right corner and choose Disable comments.